While not technically a book, this special issue of the French magazine Batailles & Blindés, written by fellow forum member 13eme DBLE, alias Cédric Mas, certainly contains all that would make for a very good book, plus some added goodies for modelers that are only available in magazines. While I can find some things to criticise, overall I think that anyone who speaks French and is interested in the war in Africa should get this, if they can (it is almost sold out), or at the very least Volume II, and hopefully Vol. III in the future. You’ll regret not following my advice. The book (for want of a better term) is about 130 pages, in A4 format. 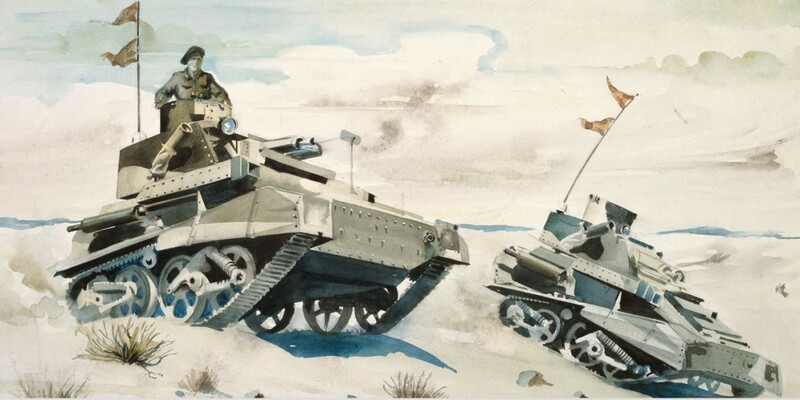 The format has been put to good use, since it contains a vast number of pictures from Cédric’s personal collection, a number of very well drawn maps, and (modelers behold), detailed plan drawings of seven vehicles that served with the Commonwealth and Axis armies in North Africa, as well as a good number of beautifully executed colour drawings of vehicles and guns of both sides. The text is a straightforward, well-researched narrative that follows the development of the battles in the desert in a lot of detail. It is obvious that Cédric has done his research, and then some. While I would certainly not always agree with him on his assessment of particular actions, overall I cannot but tip my hat to him, and even where I disagree with him, the issues are not always clear-cut. If you speak French and want a readable and accessible history of the actions in the desert, you need to look no further than this. The text is well written and marvelously supported by the large number of rare photographs that Cédric has made available for the book, all of which have been treated with care to make for good quality prints. What is nice is that Cédric is at the end of each of the three chapters addressing the key questions one may ask about a particular event or battle described in them, in the form of a set of questions and answers which address these issues. Cédric has clearly thought them through, and the analysis he provides in his answers helps to round off the narrative. It is also nice to see the Italians getting a very fair treatment in the text. A pleasant change from the usual Italian bashing. So why only four stars? Well, first of all it is in French… Okay, I am joking, that is not the issue. There are serious problems with the editing, in particular Commonwealth unit names are in some cases consistently wrong (e.g. “11th Hussards”, instead of “11th Hussars”). This may seem a minor niggle, but it starts to grate after repeated reading, also because it is such an easy mistake to avoid. Unfortunately also, the book lacks a literature list, something I would be very keen on reading, and an index. All of these things together would normally suffice to bring a book down to three stars in my view, but this would be unjustifiably harsh on the excellent research that Cédric has presented us with. So the missing star to five should be seen as an encouragement to add those missing items in the next volume, while the added star from three is a recognition of his achievement in research and presentation. A must-read, in my view. Hopefully somebody will be able to translate it into English one day. This entry was posted in Book Reviews and tagged Battles, Book Reviews, Books, DAK, Germans, Ground forces, Italians. Bookmark the permalink.